Mass: Seven days of the week at 11 a.m.
Sacrament of Reconciliation: Daily 30 minutes prior to beginning of Mass. Art Exhibit and Bookstore: 11:30 a.m. – 2 p.m. seven days a week. Chapel: Daylight hours, 7 a.m. to sunset. From 1952 until 1992, the construction remained with the incomplete appearance of a crypt. The dream of the early Oblates one day to construct on top a large National Shrine of St. Joseph went unrealized for some forty years. Finally in late 1992 extensive remodeling was begun on the chapel and completed in 1993. On November 3, 1993 the chapel was dedicated by Bishop Sylvester Ryan of the Diocese of Monterey and declared to be a diocesan shrine according to the norms of canon law, with the title “Shrine of St. Joseph, Guardian of the Redeemer.” The title is chosen after the name of the apostolic exhortation on St. Joseph, Redemptoris Custos, “Guardian of the Redeemer,” written by Pope John Paul II. Bishop Ryan also encased under the altar a relic of Saint Joseph Marello, Bishop of Acqui and founder of the Oblates of St. Joseph, who recently had been beatified on September 26, 1993, and Canonized on November 25th, 2001. The Shrine chapel continues to serve as a place of devotion for the Oblate religious community, and for individual and group pilgrims from near and far. It contains a variety of beautiful devotional artwork, the most striking of which is a six foot by eight foot original Italian wood carving of St. Joseph, Husband of Mary, Guardian of Jesus, and Patron of the Church. 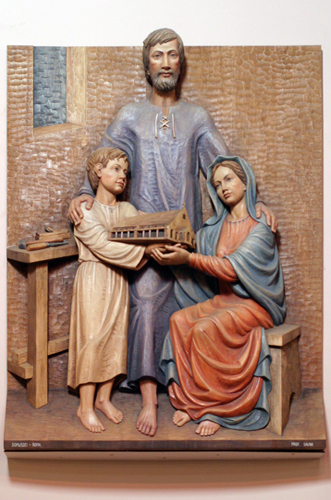 The unique St. Joseph Art Exhibit illustrates the life of St. Joseph beginning with his betrothal to Mary, the dream to take Mary as his wife, the consent, the visitation, the Nativity, the adoration of the Magi, the circumcision, and the presentation of Jesus in the Temple. It continues with the flight into Egypt, and the hidden life at Nazareth, and concludes with his peaceful death in the arms of Jesus and Mary. The exhibit includes interesting descriptions of St. Joseph’s role in the Mystery of Salvation. 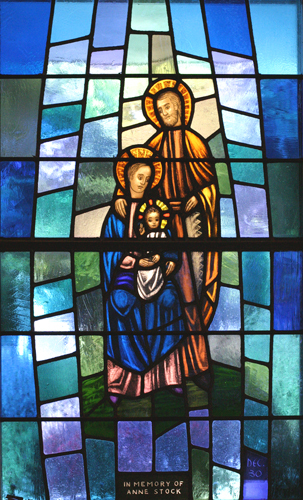 St. Joseph is seen as an obedient servant of God, the devoted husband of Mary, the loving father of Jesus, and the protector of the Holy Family. He is also portrayed as Patron of the Church, of the New World, of families, of workers, of unborn children and expectant parents, of migrants and refugees, and of a peaceful death. Guardian of the Redeemer Bookstore and Giftshop specializes in literature and items of devotion relating to Saint Joseph and Saint Joseph Marello, including books in Spanish and Italian. The bookstore serves as the principal outlet for Guardian of the Redeemer Publications. All literature carried is in the spiritual tradition of Saint Marello and in harmony with the authentic teaching and pastoral practice of the Roman Catholic Church. Seven Sorrows and Joys of St. Joseph: Every Wednesday after Mass. Adoration and Benediction of the Blessed Sacrament: First Fridays. 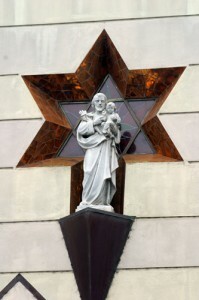 Fathers’ Day: Mass offered for fathers, living and deceased, in honor of St. Joseph, Patron of Fathers. Labor Day: St. Joseph, Model of All Who Work. Held each year the second Sunday of August on the Shrine grounds, the pilgrimage is a day of spirituality and recreation for friends of the Shrine from all over. It begins with Mass, includes a Barbecue and entertainment, and finally an outdoor procession in honor of St. Joseph, ending in the chapel for Benediction of the Blessed Sacrament. Shrine Chapel, seating about 200 people. Saint Marello Conference Room, seats about 50 people for retreats and talks. Masante Hall and Kitchen, seating 95 for dining. Beautiful grounds right across the street from the Monterey Bay.